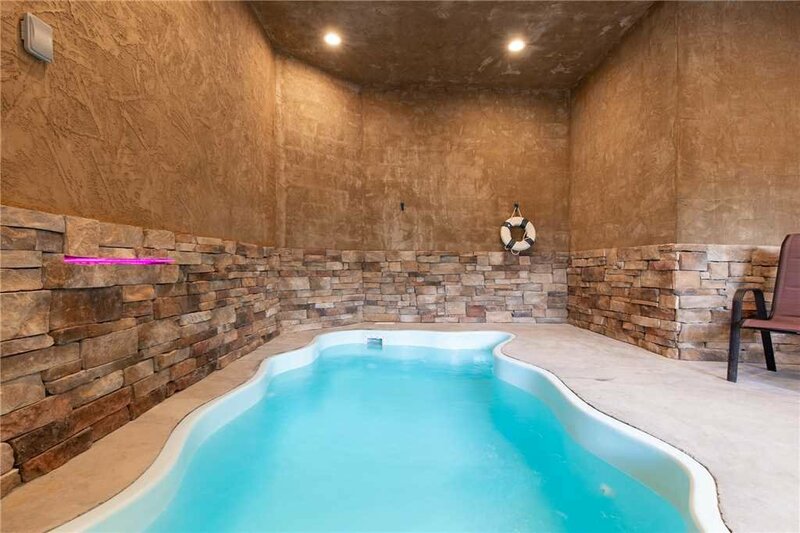 Splash of Moonshine has so much going for it, we don’t know where to begin. 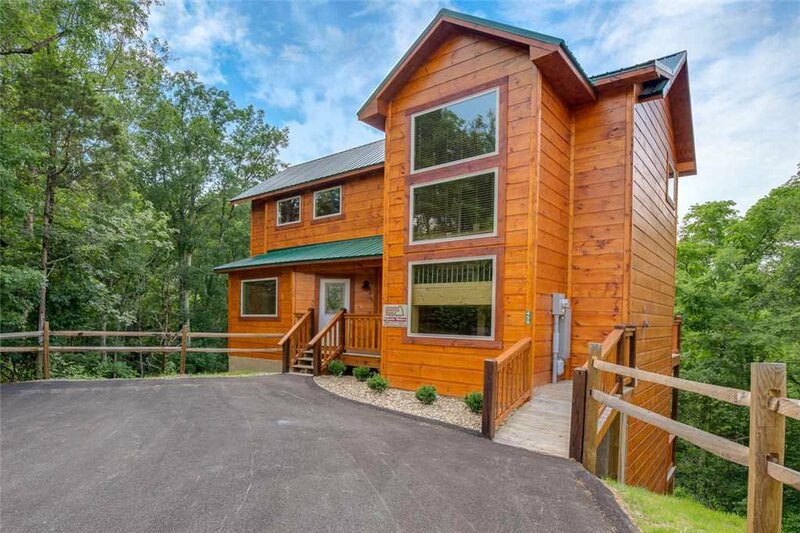 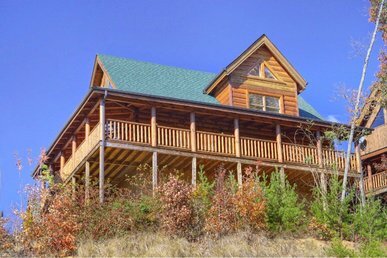 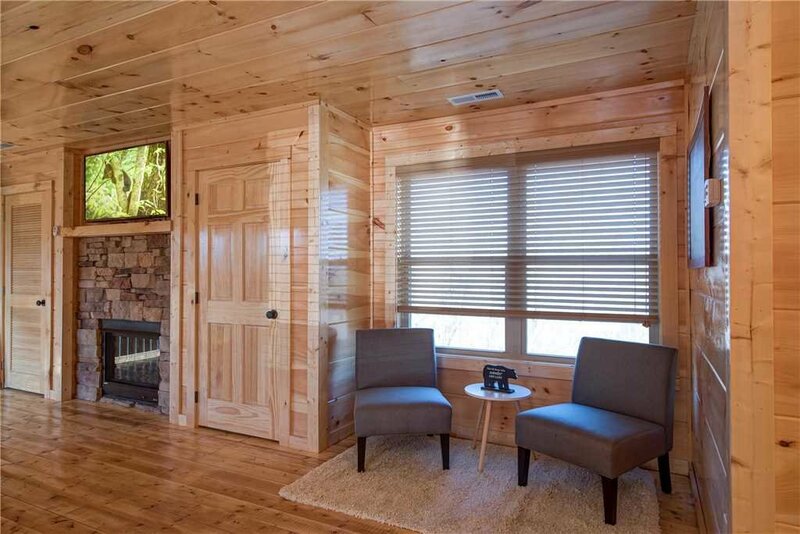 The pet-friendly, 2-bedroom log cabin is just 5 minutes from the Pigeon Forge Parkway, home to the Titanic Museum, dinner theaters, theme parks, WonderWorks, the Tanger Outlet Mall, and more. 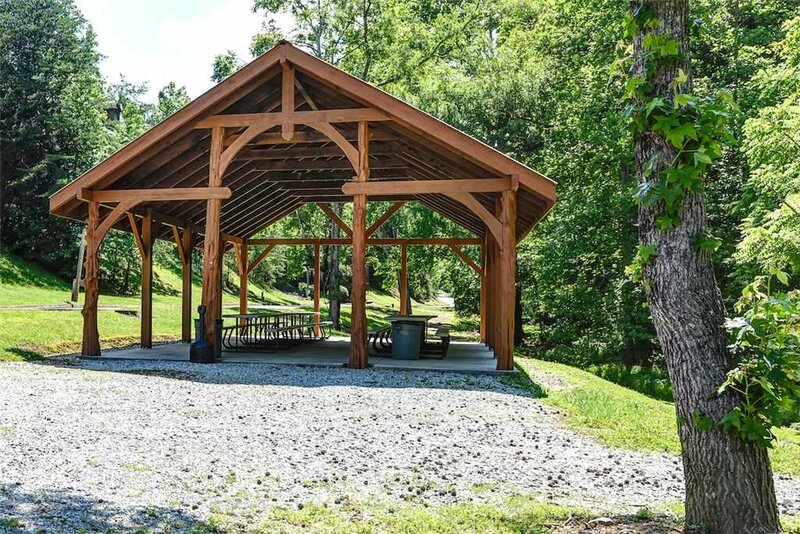 It’s located in the Alpine Mountain Village resort, whose amenities include an outdoor pool, a playground, and walking trails along a burbling stream. 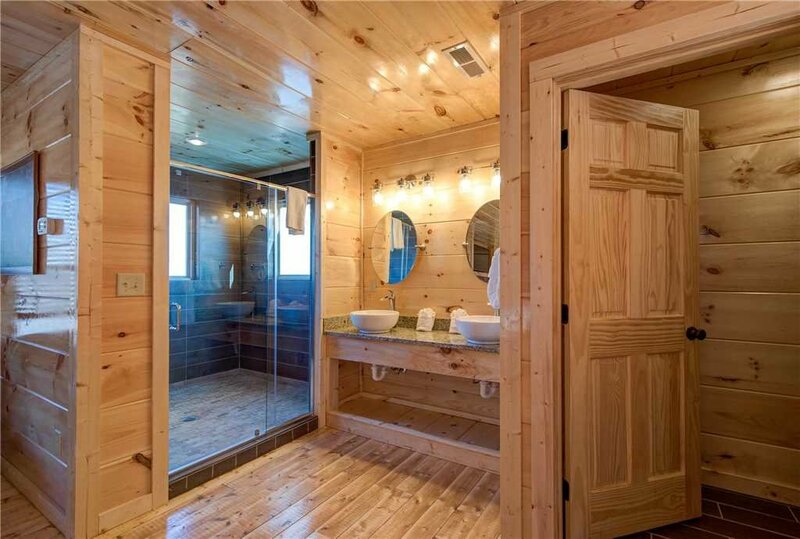 And the cabin’s own special features include an outdoor hot tub and an indoor pool. 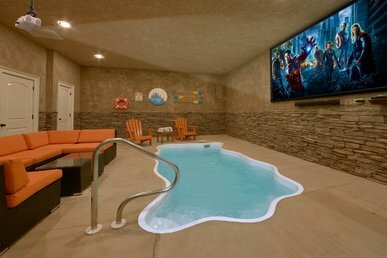 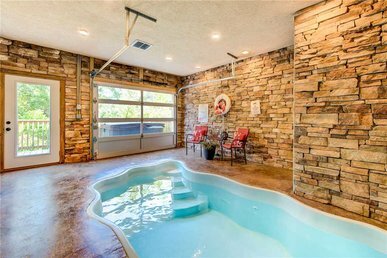 That’s right: Splash of Moonshine has a delightful in-ground pool in its lower level, complete with a mini waterfall that the kids will adore. 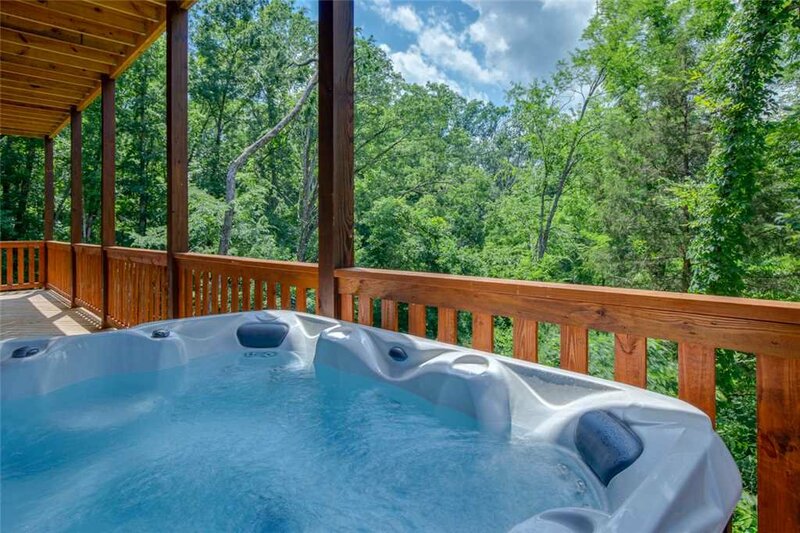 What a treat to splash about first thing in the morning or late at night without having to leave the cabin! 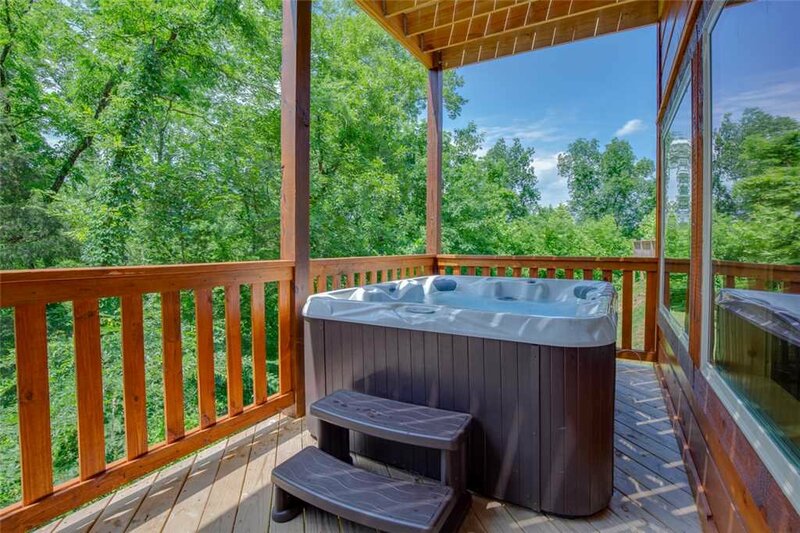 The same goes for soaking in the hot tub, located on the lower deck. 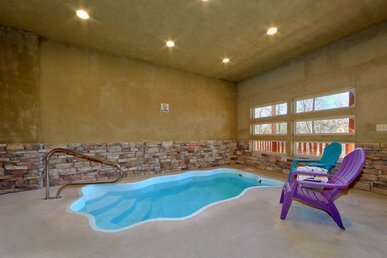 Especially after a day of hiking or horseback riding, the tub’s massaging jets of steamy water will feel so luxurious. 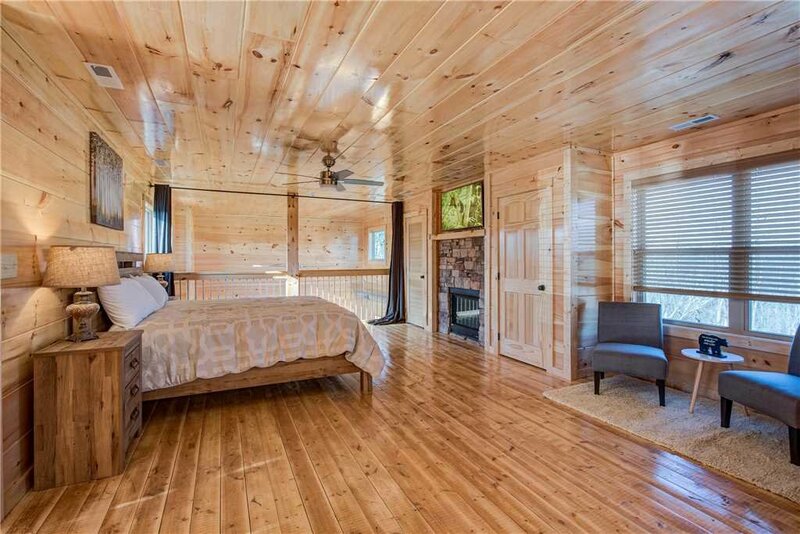 And while we’re on the topic of luxury, wait until you see Splash of Moonshine master suite. 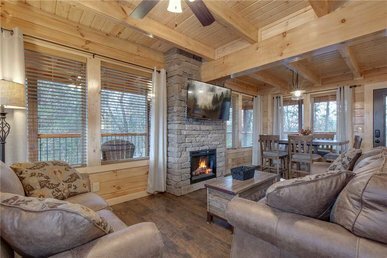 Large enough to include a sitting area as well as a king-size bed, the bedroom also has a stone-surround gas fireplace, perfect for romantic winter evenings, and a large flat-screen TV. 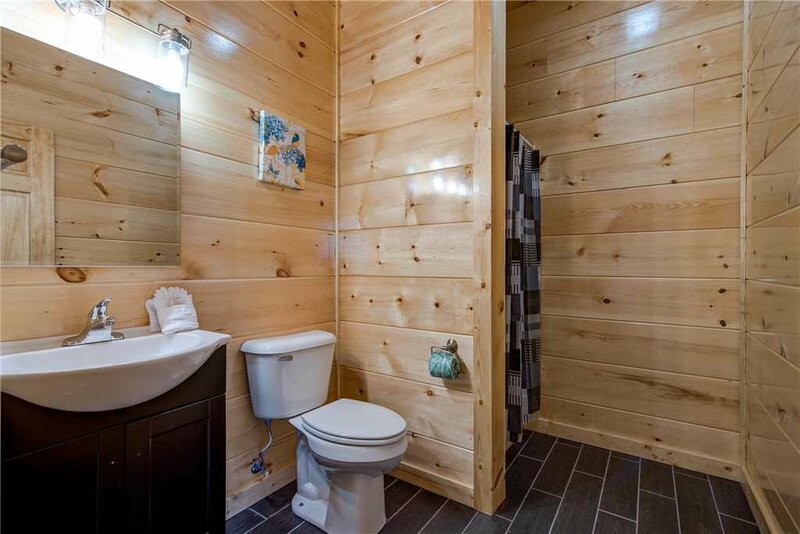 Just as pampering is the en-suite bathroom, with a spa-like walk-in shower. 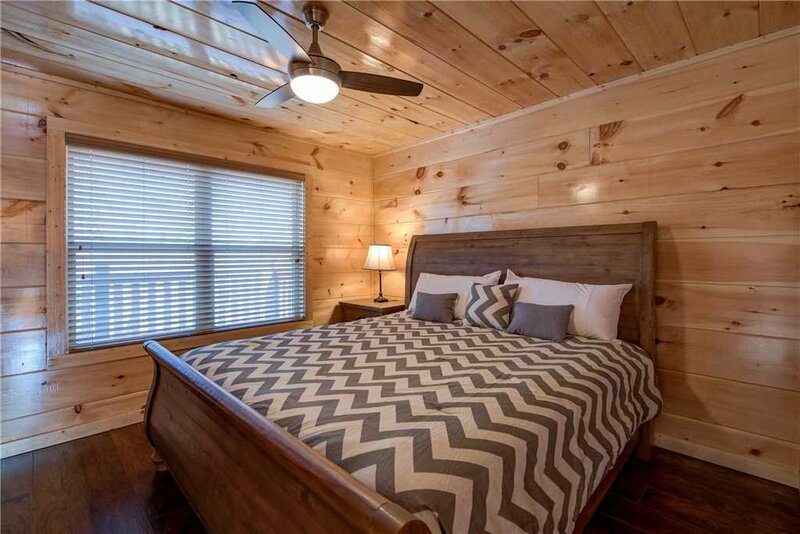 The cabin’s 2nd bedroom would be considered the master in any other cabin. 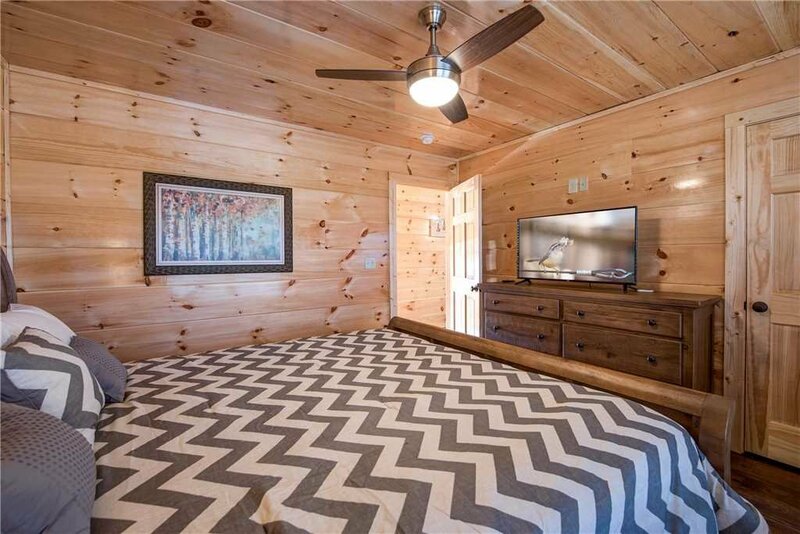 It too has a king-size bed, a flat-screen TV, and ample storage. 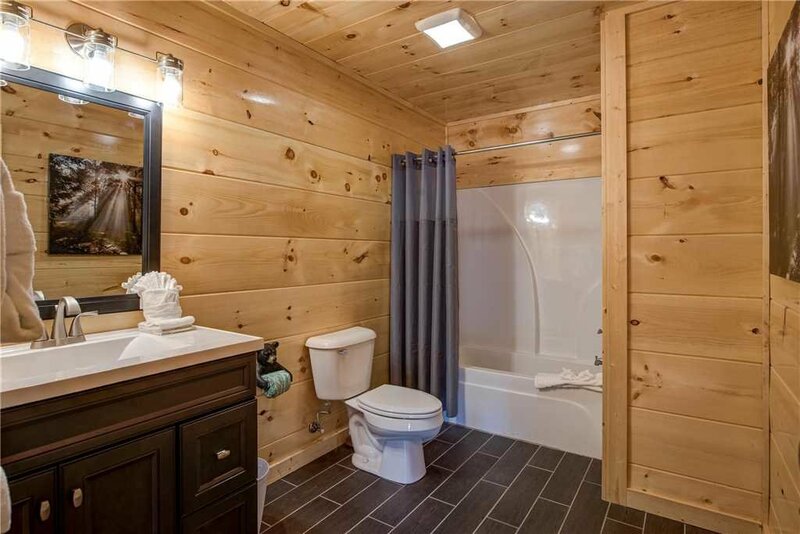 There’s a 2nd full bathroom as well, plus a convenient half-bath. 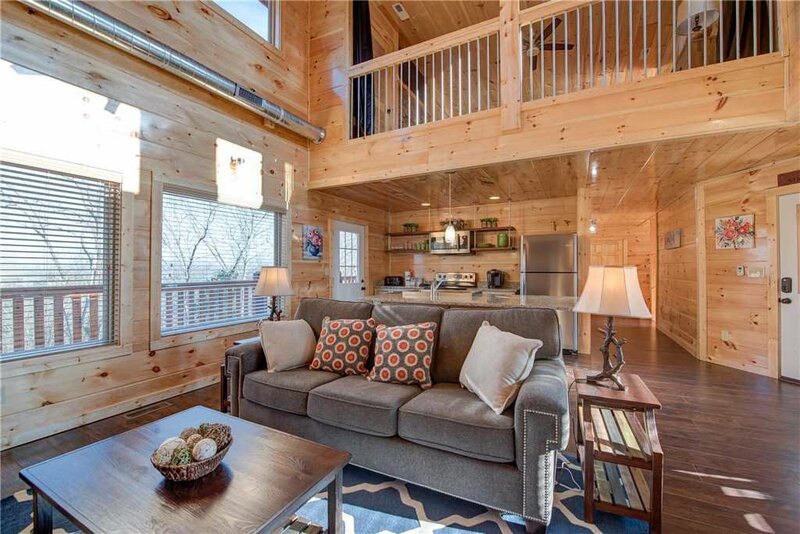 If you have additional guests, the sofas in the main floor’s great room and the downstairs game room open into beds for 2, enabling Splash of Moonshine to sleep 8 people in all (plus a 4-legged friend or 2). 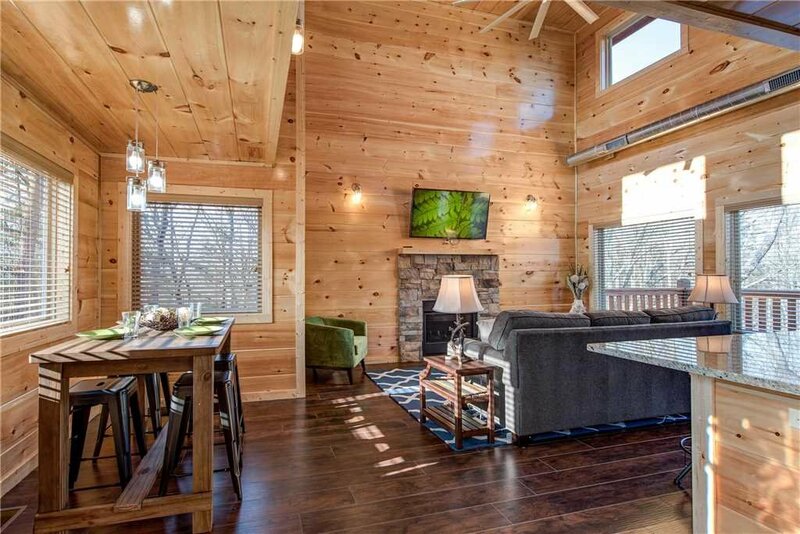 The great room really is worthy of the moniker. 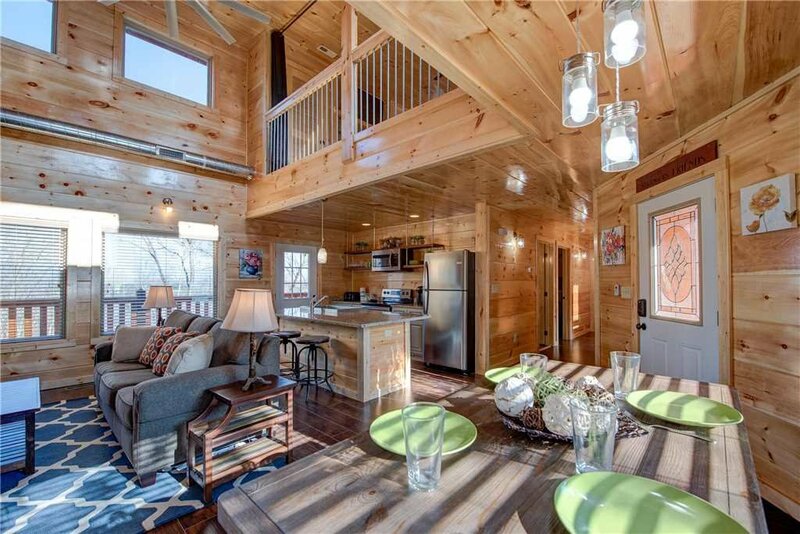 A double-height ceiling adds to its airy ambience, while the oversize windows let in plenty of sunlight and views of the wooded surroundings. 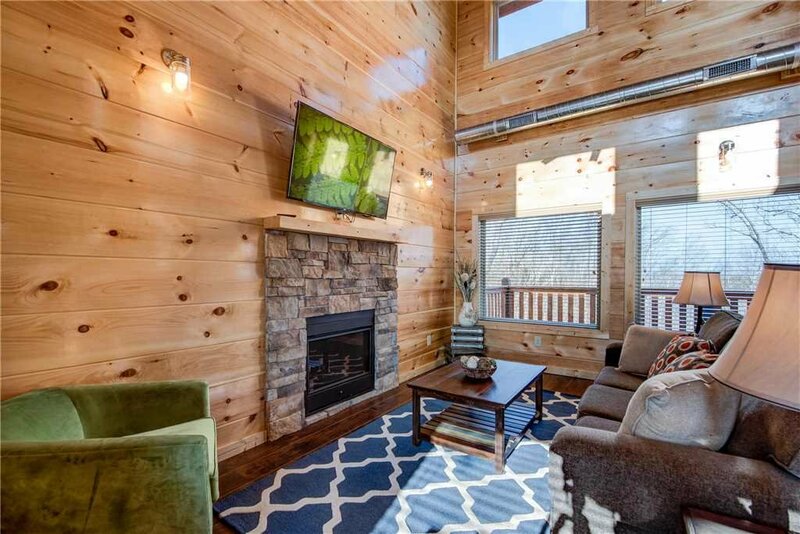 Whether you’re watching a movie on the flat-panel TV, surfing the web via the free WiFi, playing Uno with the kids, or enjoying an après-ski drink by the fireplace, you’ll feel blissfully at home here. 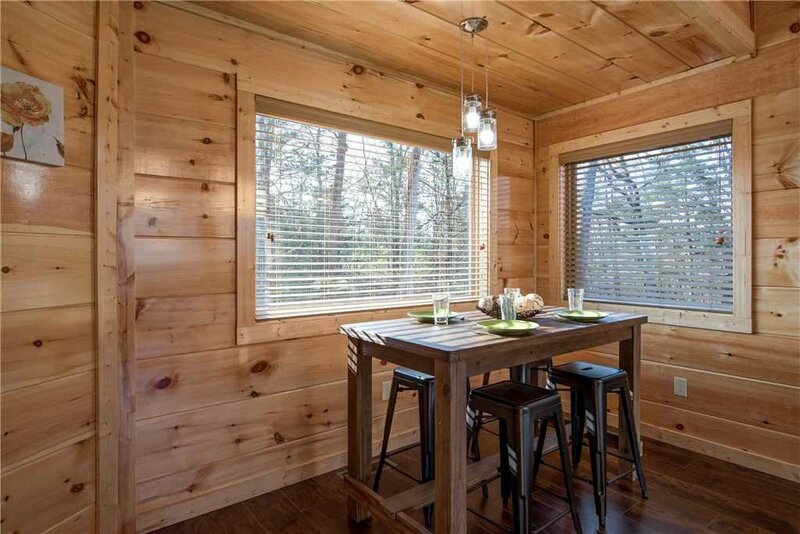 With a table and a breakfast bar, the dining area seats 6 people. 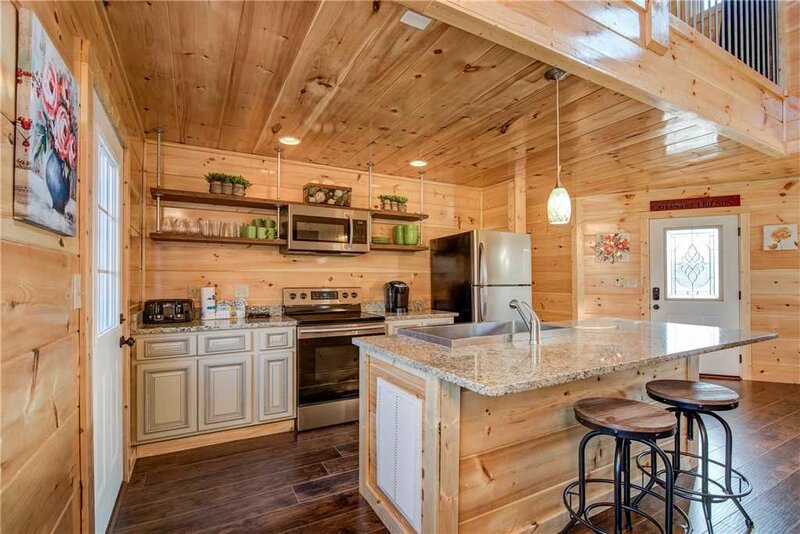 Even if you eat most of your meals out (there are scores of restaurants nearby, specializing in everything from barbecue to pizza), you’ll appreciate having a fully equipped kitchen at your disposal any time you want. 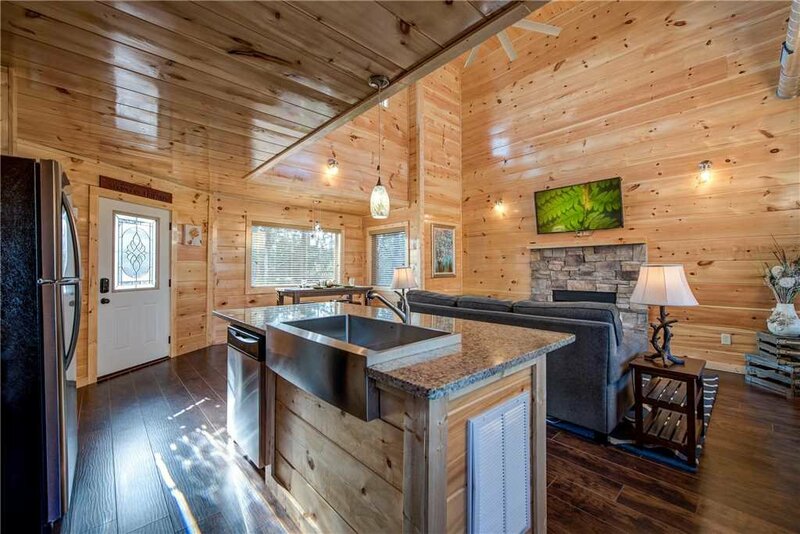 And if you do decide to cook while you’re here, you’ll find all the appliances, cookware, and tableware you could possibly need. 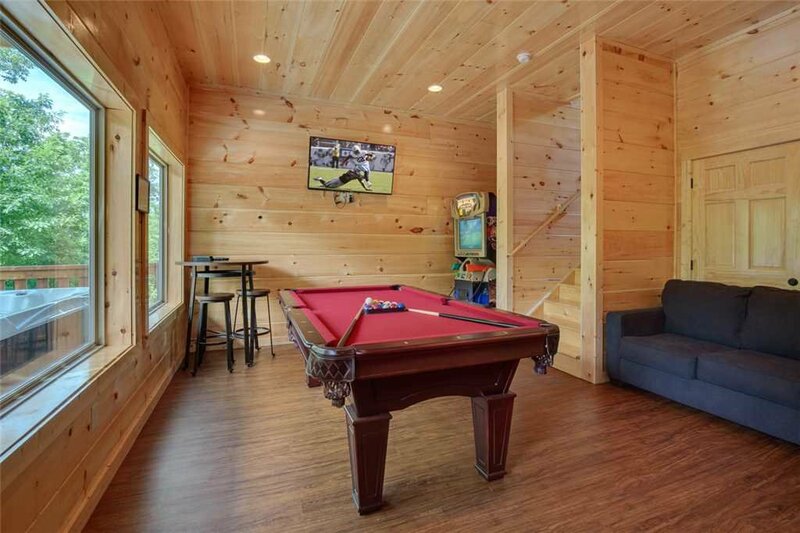 Downstairs, beside the swimming pool, is the game room. 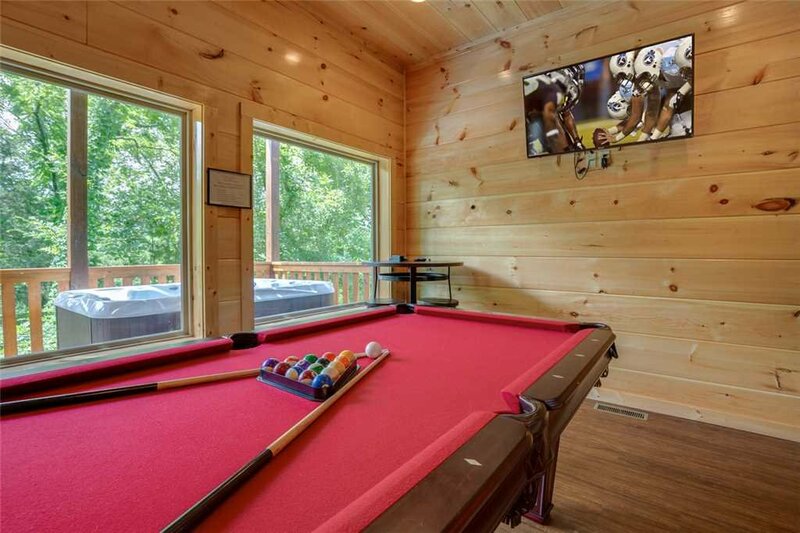 The full-size pool table is the centerpiece, but the room also offers yet another flat-screen TV, a Buck Hunter arcade game, a pub-style table and stools, and a couch made for lounging. 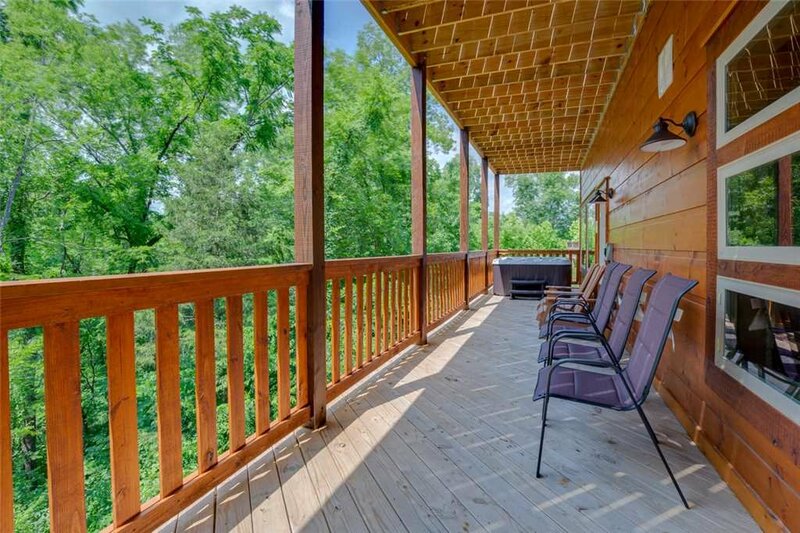 When the weather’s good, however, you’ll probably want to hang out on one of Splash of Moonshine large decks instead. 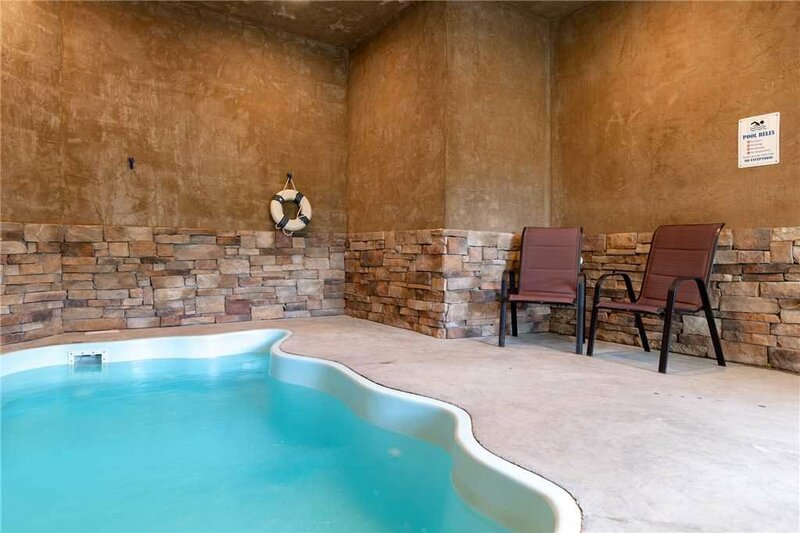 Besides soaking in the hot tub you can kick back on one of the numerous chairs and revel in the crisp mountain breeze. 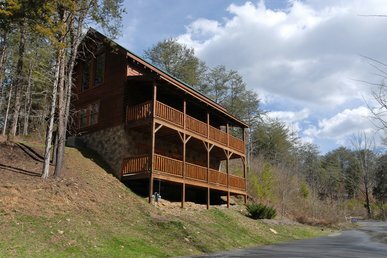 The Alpine Mountain Village resort in which Splash of Moonshine is located has its own attractions. 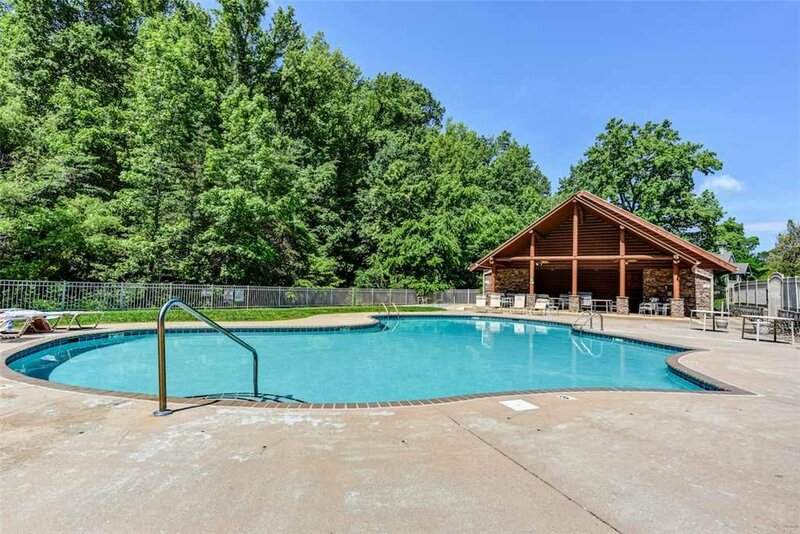 In the summer you can swim in its outdoor pool, then dry off on a poolside chaise afterward before heading to the picnic pavilion for lunch in the shade. 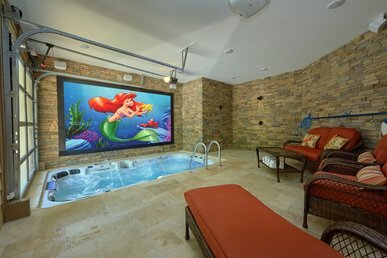 Little ones can frolic in the play area year-round, and everyone will enjoy strolling along the resort’s hiking path, which meanders alongside a stream. 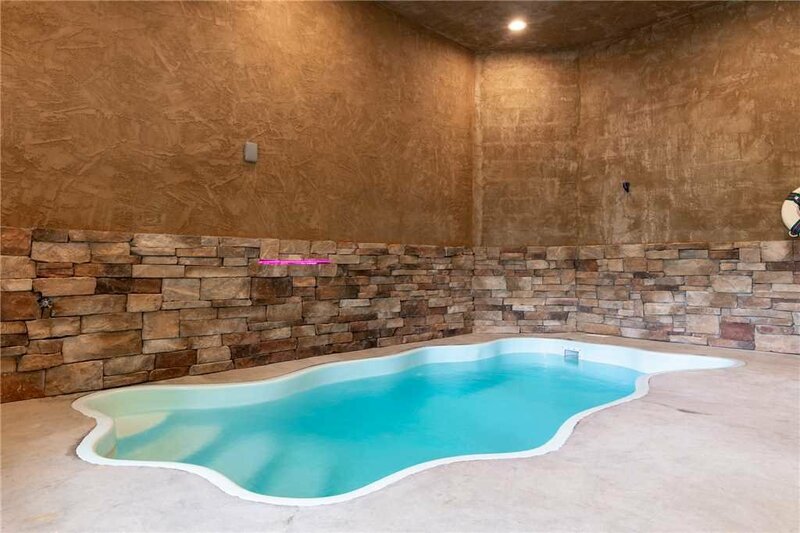 And then there’s the convenient location. 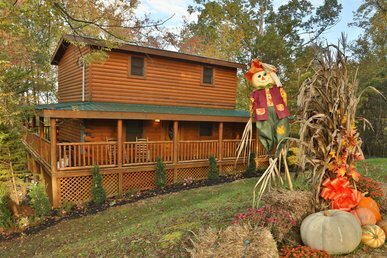 Dollywood, Parrot Mountain and Gardens, and the numerous attractions of the Pigeon Forge Parkway are no more than 15 minutes away. 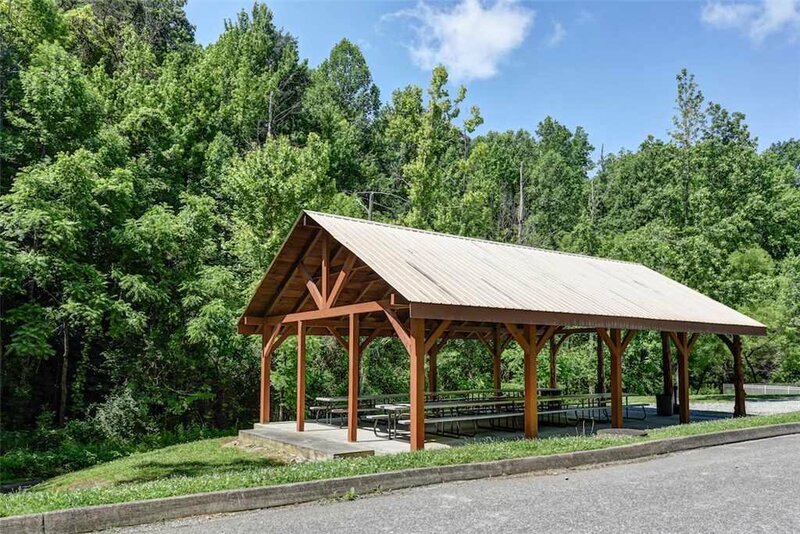 And, in less than a half-hour you can be exploring the Great Smoky Mountains National Park or the Great Smoky Arts & Crafts Community. 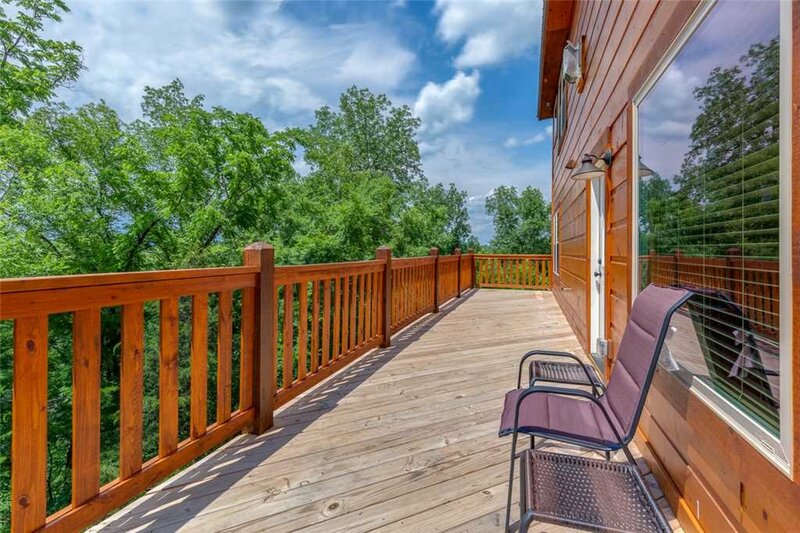 At Splash of Moonshine you can live the good life, Smoky Mountain style. 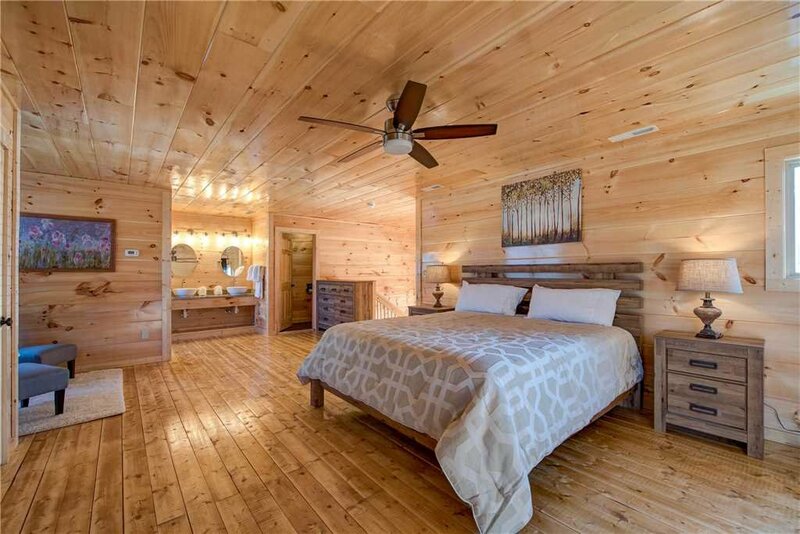 Don’t miss out—book your stay today!